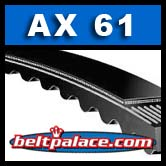 AX61 Molded Notch V-Belts (Similar to Tri-Power/Power King Cog) AX Series. 63" Length (1600mm), 1/2" Width. Cogged V-Belt (Molded Notch) AX-61. Replaces: Gates AX61, Dayton/Dayco 3GWX9, Same as Armstrong-Allied-Lennox Air 64W55 100245-01 HVAC Belt, Goodyear Torque-Flex AX61, Heavy Duty AX-61 Cogged V-Belt. Gates Product 90122061.